Actions: Veritable perfecting treatment for the skin, this concentrate tightens the pores and refines skin's texture for a more uniform complexion. Prevents thickening and regulates the flow of sebum. Absorbs sebum and detoxifies. Tightens the texture of the skin. Promotes optimal maintenance of cutaneous metabolism over time. Slows the factors responsible for cutaneous aging. Optimizes the cells energetic environment and boosts their activity. Reduces the size of pores! Results: Skin that is detoxified, deep down. A purified complexion, lastingly uniform. Skin that stays younger, longer. Energized skin that functions at top capacity. The skin texture is refined. 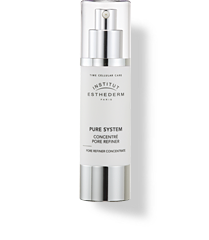 Indications: Dilated pores - Impure skin - Excess sebum - Skin imperfections - Shiny skin. Instructions for use: Apply morning and evening alone or before your usual skin care product. Apply on clean, dry face. May also be used locally on particularly effected areas. This is a serum so it should always be applied first before other product!